During the first half of the twentieth century, automobile production in the United States began to surge due to Henry Ford’s techniques of mass-production through unified parts and assembly lines. 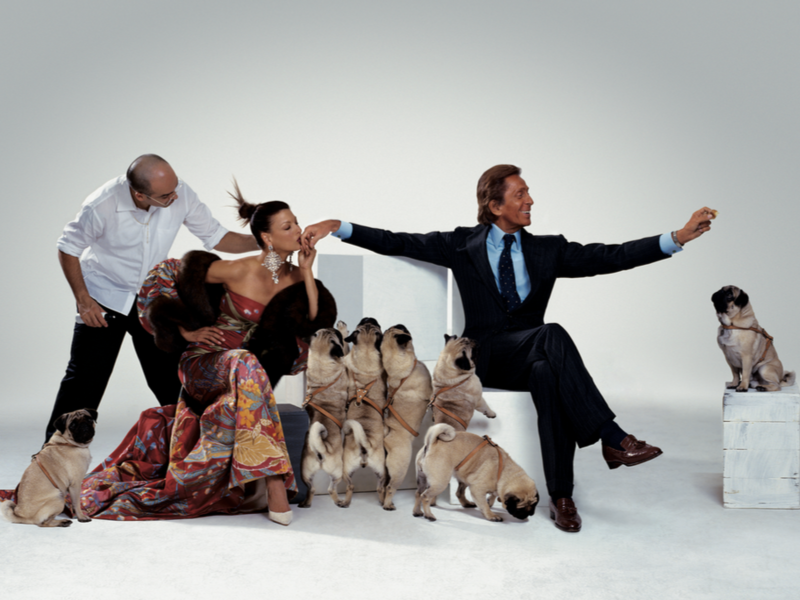 This correlation with the rise of mass fashion in the mid-1800s, which also expanded its industry thanks to unified parts and assembly lines, is not to be understated, nor is the connection with Andy Warhol’s mass-produced pop art of the 1960s. 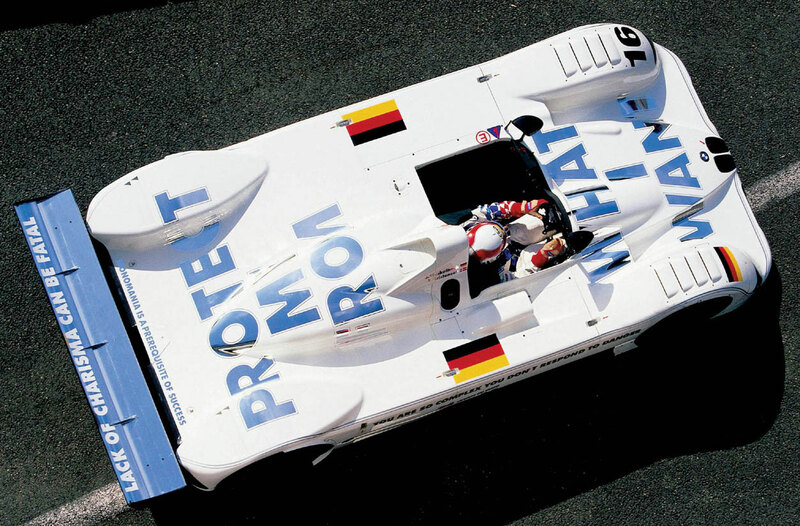 As the popularity of cars grew, so too did their place in culture. 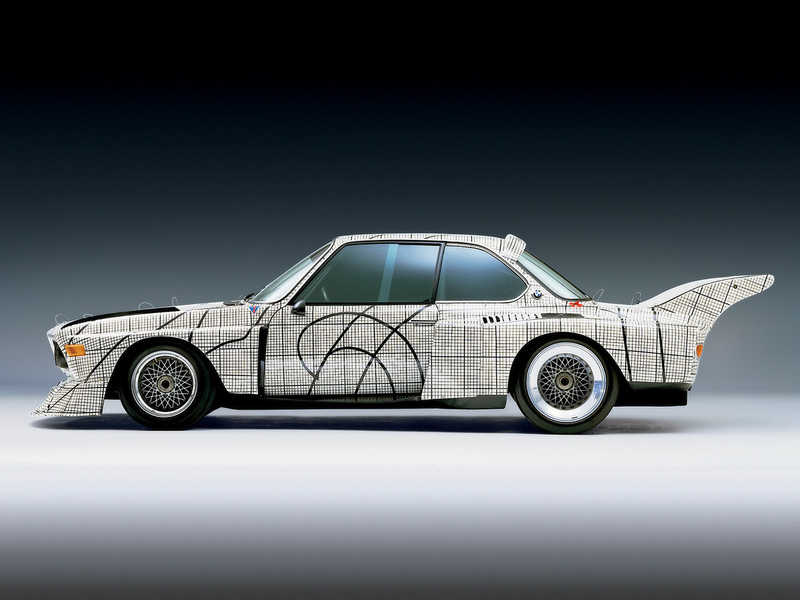 It is no surprise then, that artists, designers, fashion brands, and architects have a longstanding history of incorporating automobile motifs into their work. 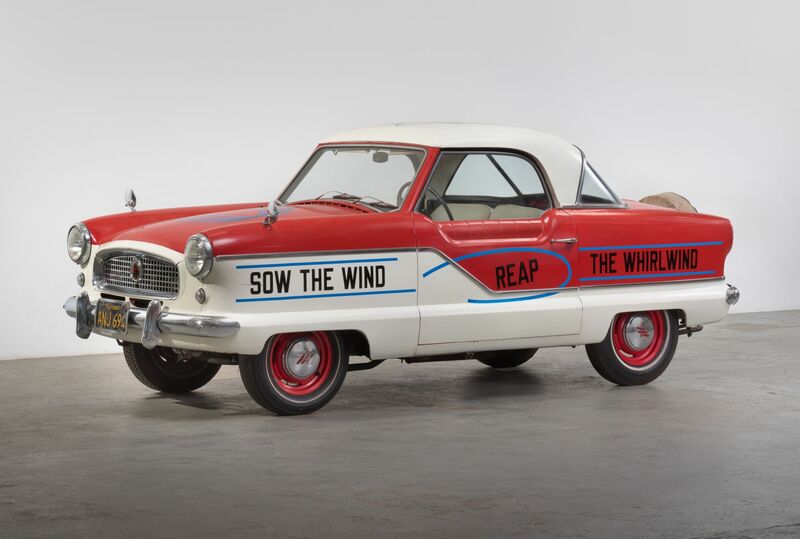 In 1953, Robert Rauschenberg produced a collaborative piece with composer John Cage in which Cage drove his Model A Ford across a twenty-two foot, laid out scroll of paper. Cage’s back tire, which was driven through paint, left a track mark across the paper canvas, while the un-painted front tire left a merely faint impression. 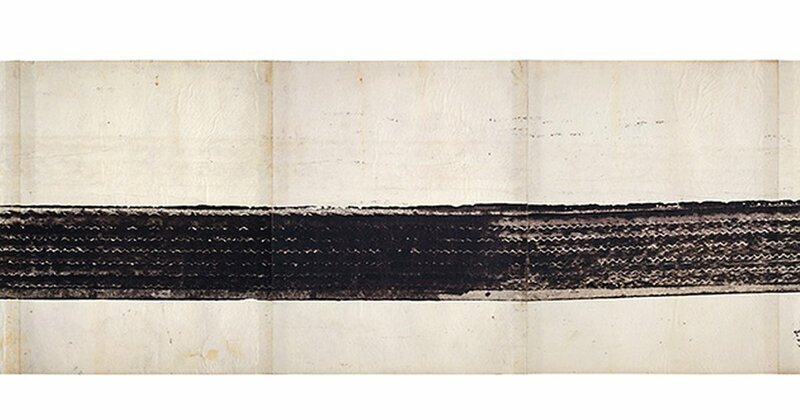 In addition to challenging existing notions of art and collaboration, this work, entitled Automobile Tire Print, demonstrates the increasing interest with the automobile amongst artists and, by extension, the incorporation of machinery in art. 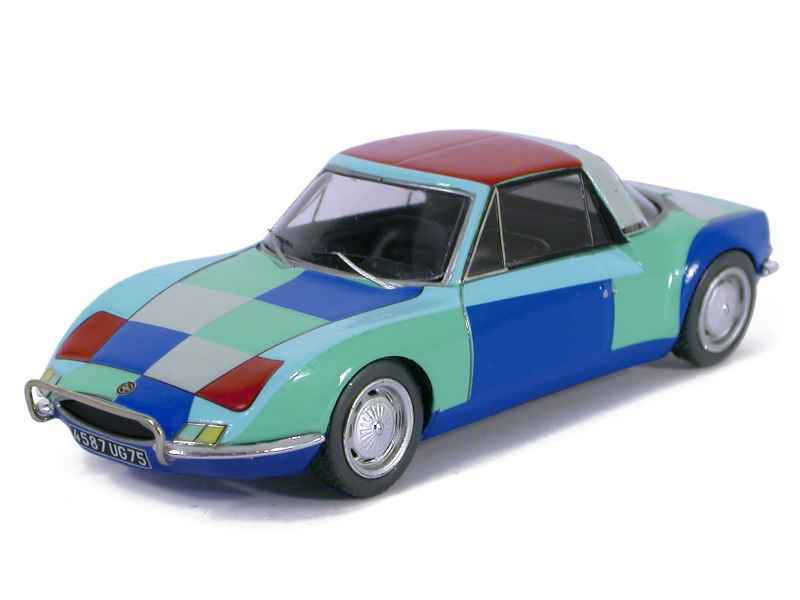 The 1960s saw this fascination continue across a variety of mediums. 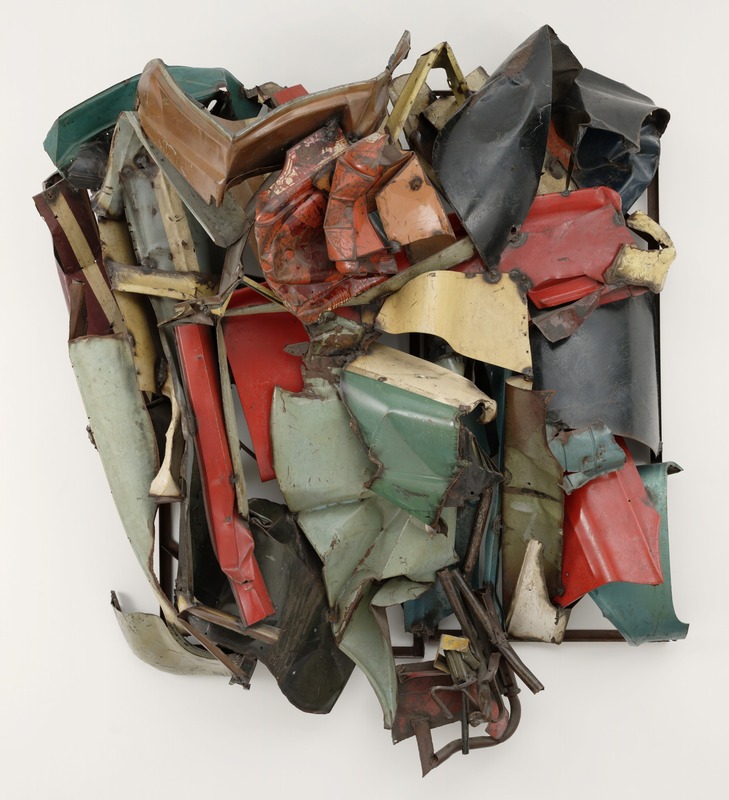 John Chamberlain’s 1960 sculpture Essex uses automobile parts, a theme the artist would continue expanding upon throughout his career. 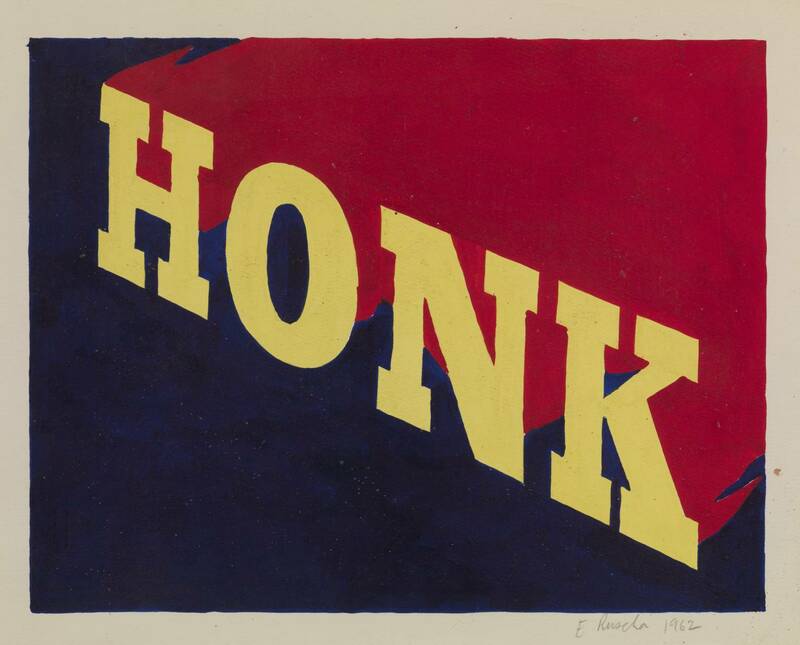 Ed Ruscha’s Honk, painted in 1962, is a particularly interesting and contradictory work. 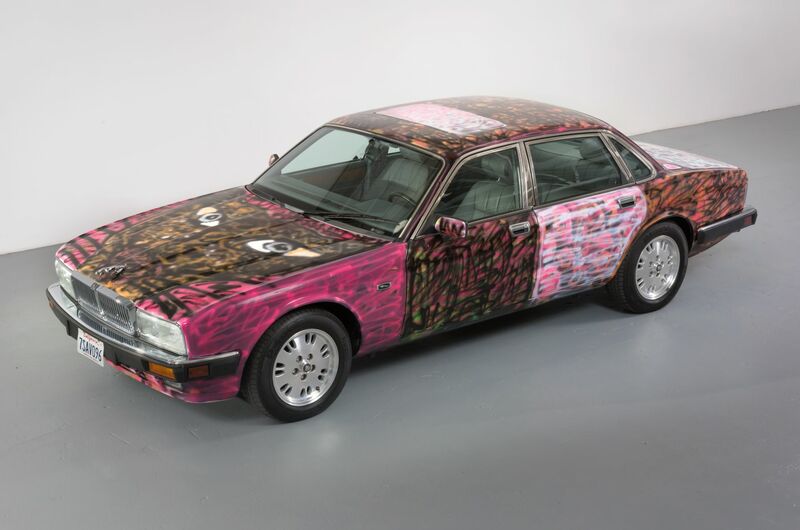 The piece depicts the word “honk” in bold, graphic letters, indicating that, like a car, the work itself is mass-produced. The work, however, shows no sign of stenciling and was in fact painted free hand; the brushstrokes and stippling effects that are visible in the large blue and red portions of the canvas cannot be recreated. 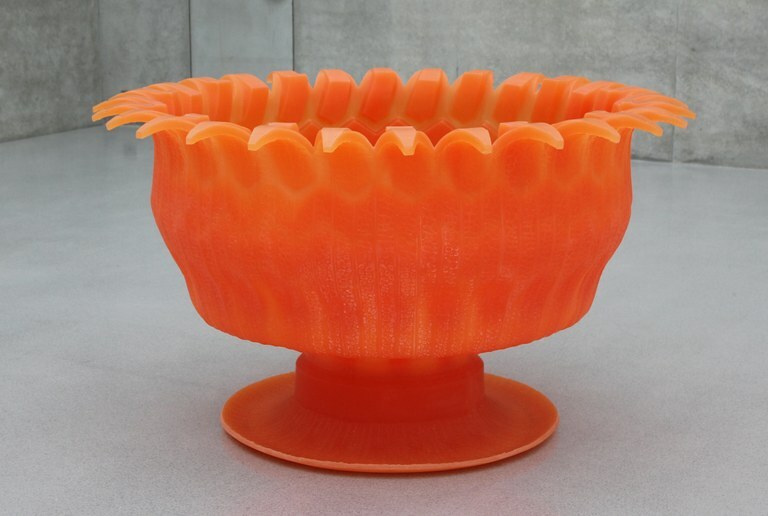 The piece, therefore, comments on issues of mass-production and mechanization. 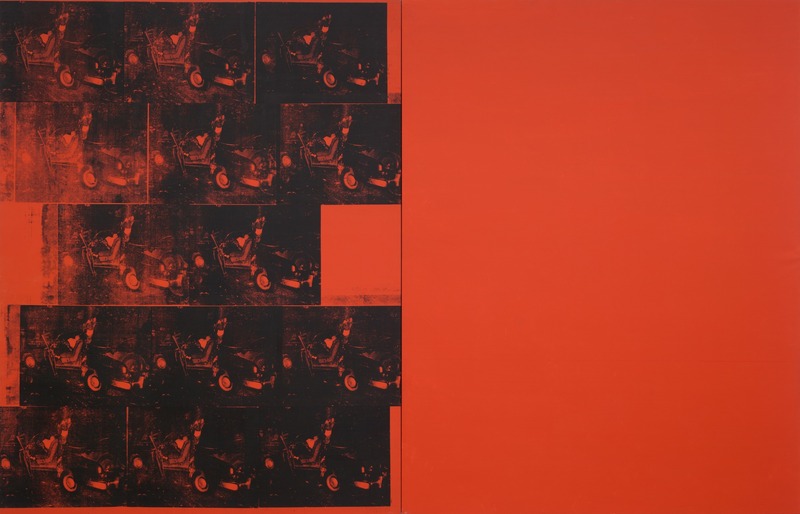 Also in the 60s, Andy Warhol produced a number of car crash paintings as part of his Death and Disaster series. 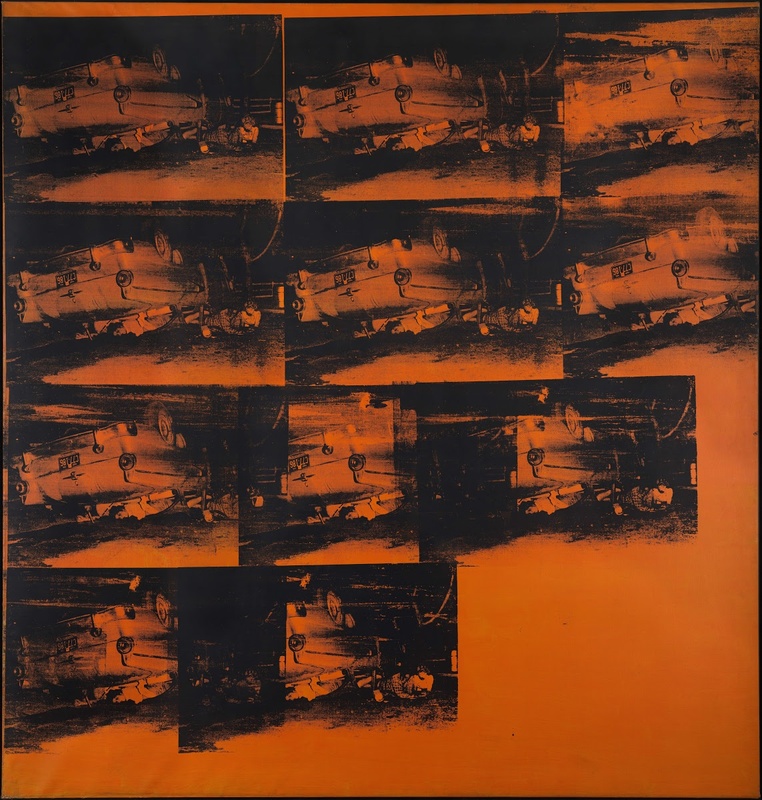 The works employ painting and photography, as well as the repetitive nature of his artistic practice, to place gruesome images into a more distanced lens. 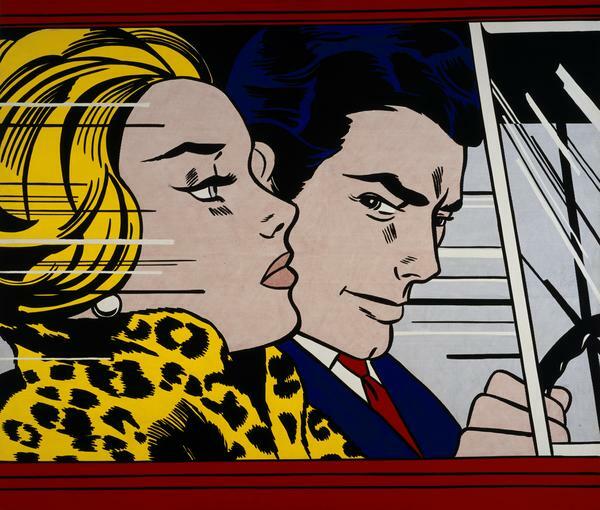 Likewise, Roy Lichtenstein’s painting ‘In the Car’, based on the Girls’ Romances comic explores the relationship between automobiles and sexuality, romance, and Americana car culture of the 1960s. 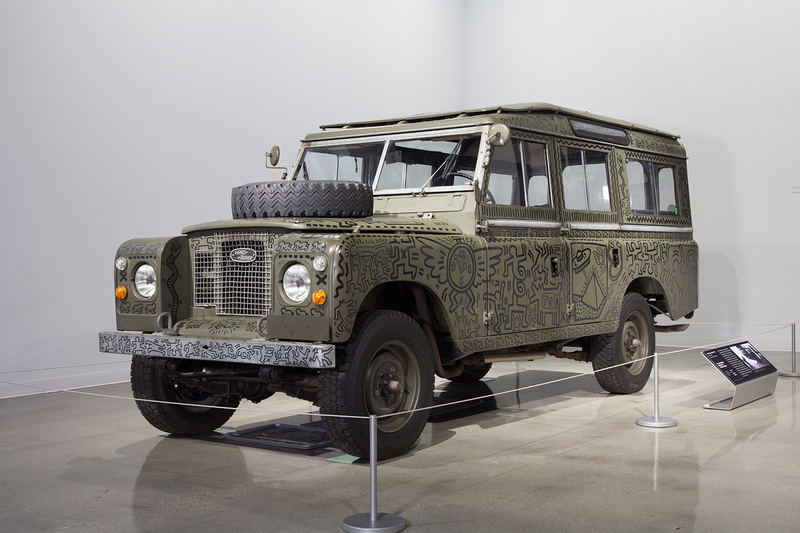 Although this surge of art world interest with cars is usually associated with the 1950s and 60s, this unique fascination has continued into the present day. Nate Lowman’s paintings of car air fresheners on shaped canvas explore ideas of youth through pop art. 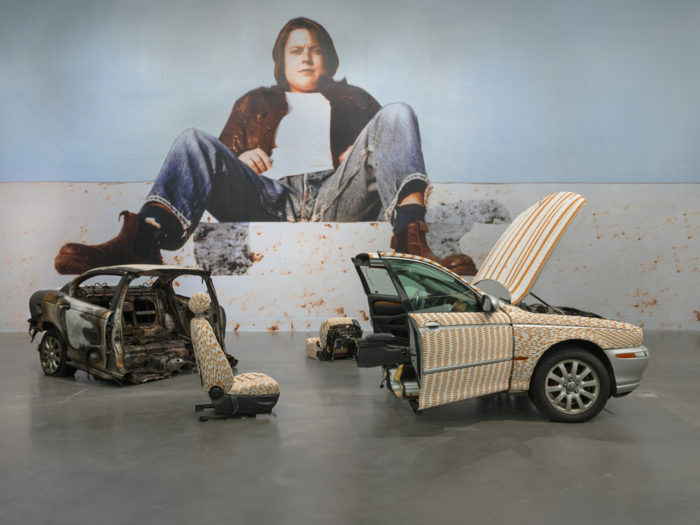 Sarah Lucas’ 1998 sculptural Life’s a Drag (Organs) installation shows two burnt out cars covered in cigarettes, perhaps exploring volatility, while Tom Sachs’ untitled work using a 1989 Chevy Caprice similarly utilizes the car as a form of sculpture. 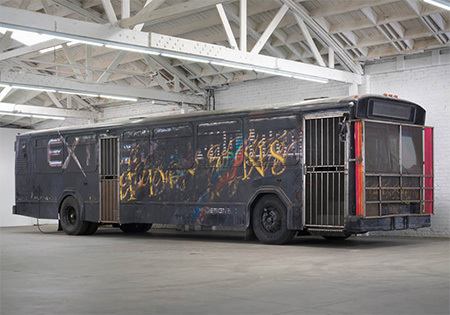 Sterling Ruby’s 2012 Bus does the same, placing a converted bus alongside a pigpen, exploring the stationary nature of society and it's citizens. 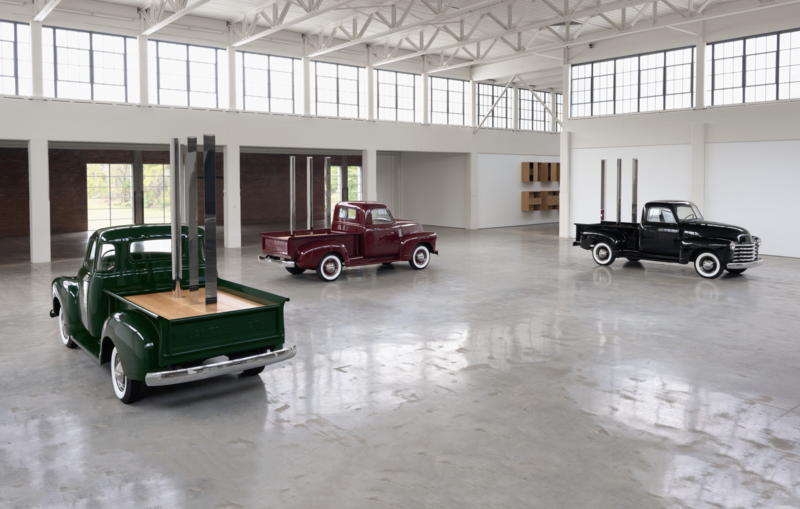 While Walter de Maria’s final piece created before his death, Truck Trilogy, similarly uses sculpture to disrupt the automobile, employing vertical metal bars to divide truck beds. 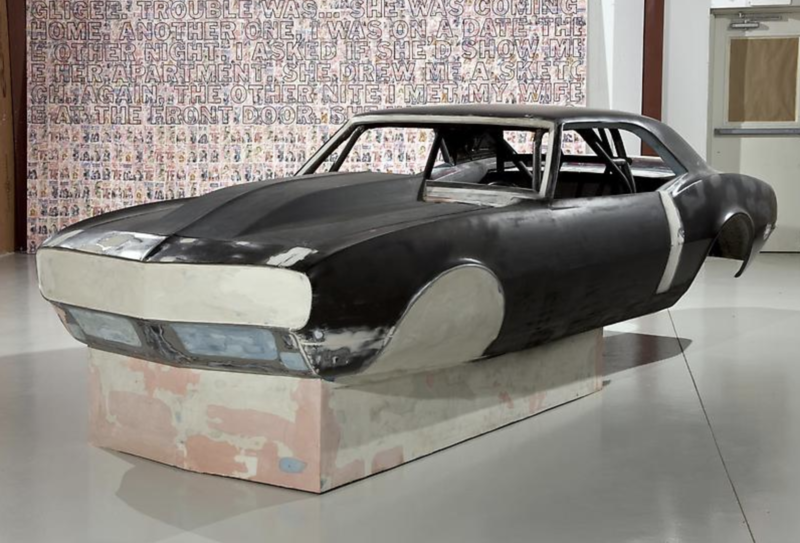 The fascination with cars in the art world can be culminated in the works of Richard Prince, whose work often involves whole cars as well as hoods and isolated parts. 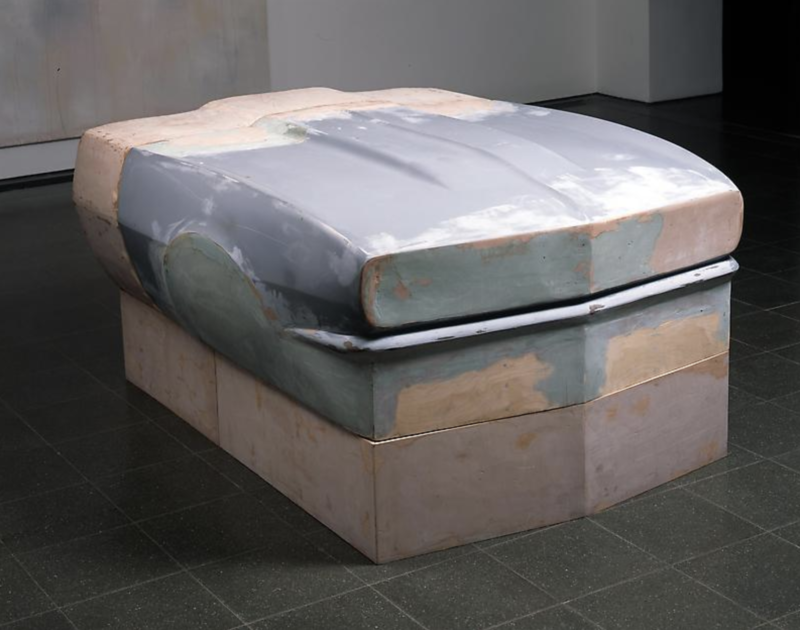 Pieces such as Pure Thoughts (2007), Elvis (2007), and Dear Mary (2008) utilize cars in their totality, while others like Continuation (2004-5) and Daddy Richard (2007) convert car hoods into sculpture pedestals, and Prince’s tire planters employ repurposed car tires for sculptural means, further solidifying the relationship between automobiles and art. 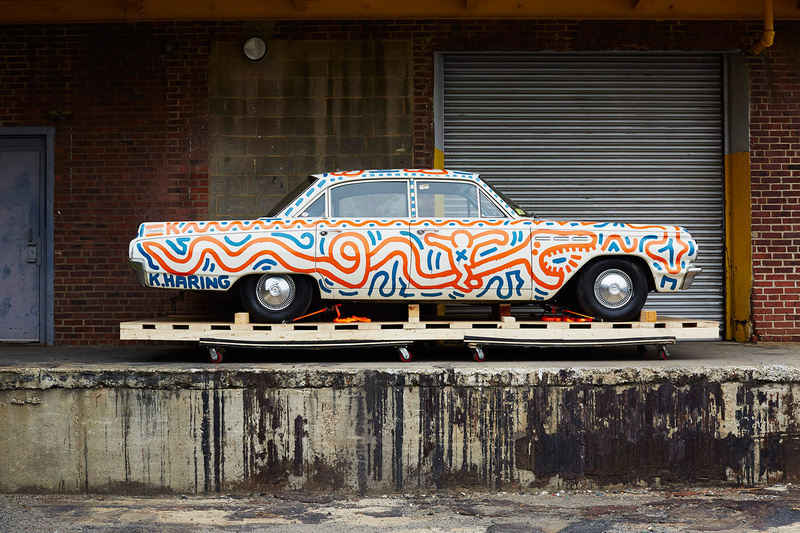 The art world’s obsession with cars and car culture is hardly a solitary infatuation. 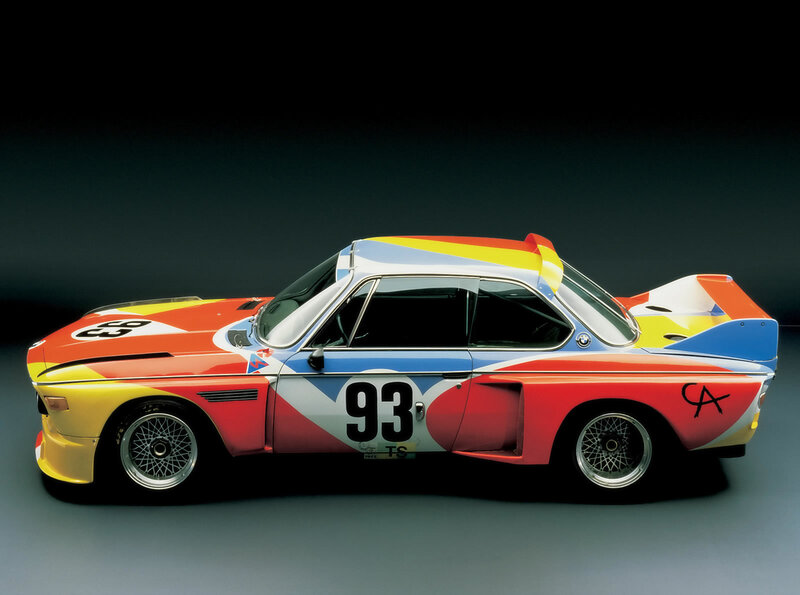 Over the past four decades, the BMW Art Car Collection, for example, has commissioned 19 international artists to design BMW cars, beginning in 1975 when race car driver Hervé Poulain asked friend and artist Alexander Calder to decorate a 1975 BMW 3.0 CSL. 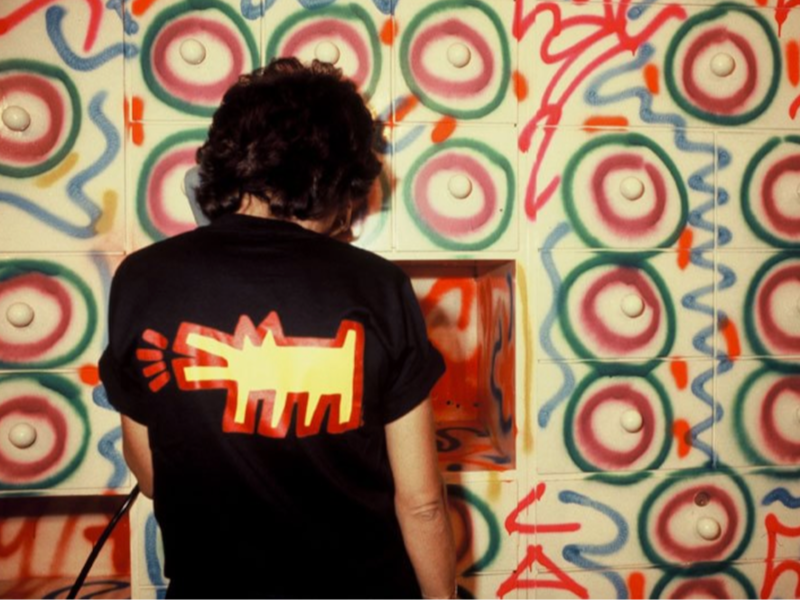 Since then, artists including Jeff Koons, Frank Stella, Roy Lichtenstein, Andy Warhol, David Hockney, among others have also participated in the collective collaboration. 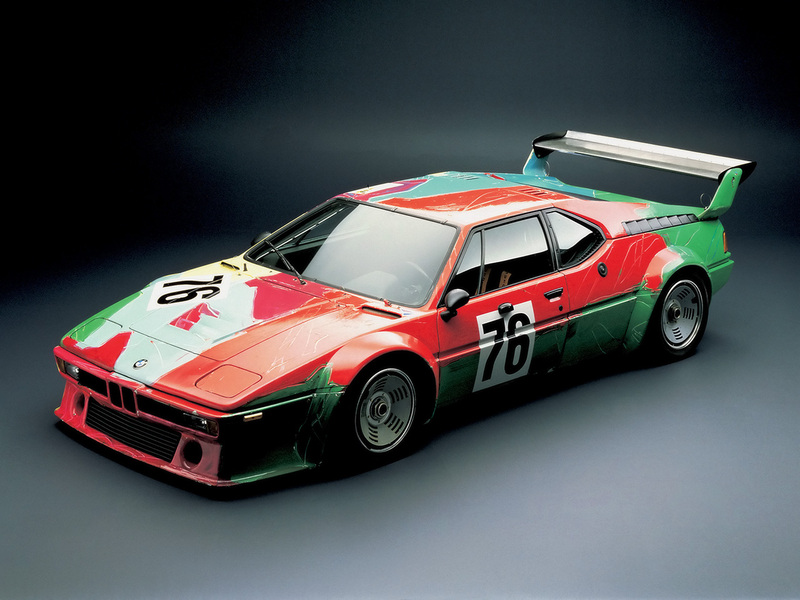 In recent years there have been numerous exhibitions devoted solely to the subject of cars. 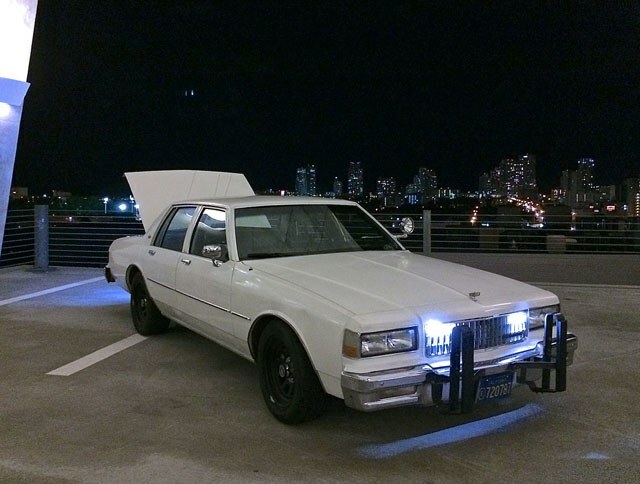 Los Angeles’ Venus gallery exhibited Piston Head II: Artists Engage the Automobile in 2016. 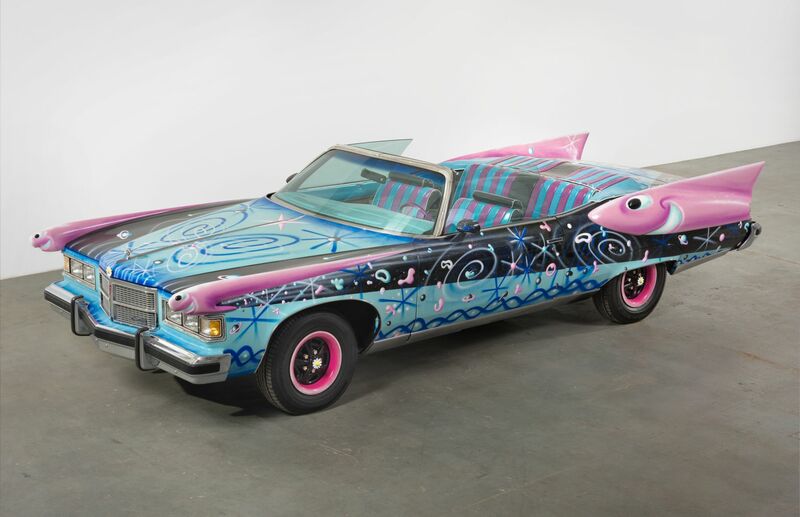 This exhibition examined the automobile as both a part of pop culture and as a sculptural form, showing works by artists Katherine Bernhardt, Jonas Wood, Kenny Scharf among others. 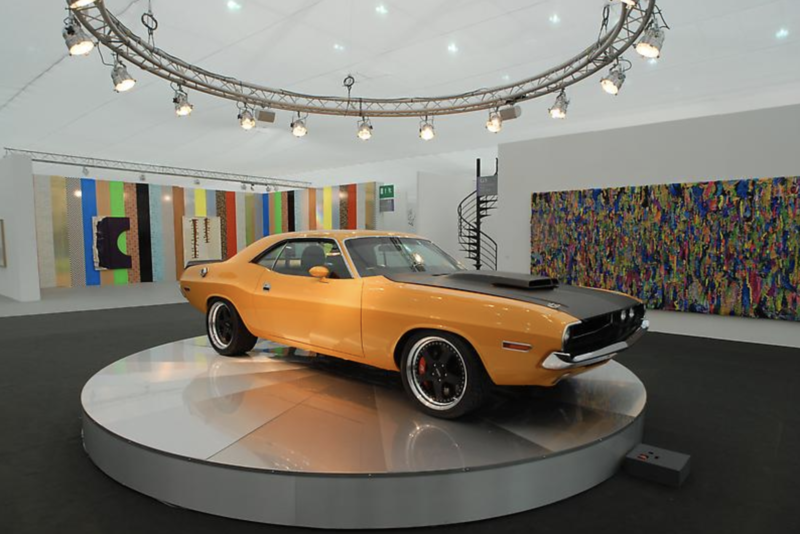 As such, the exhibit explored the contradictions of the automobile as well as trying to determine why artists find such inspiration in cars. 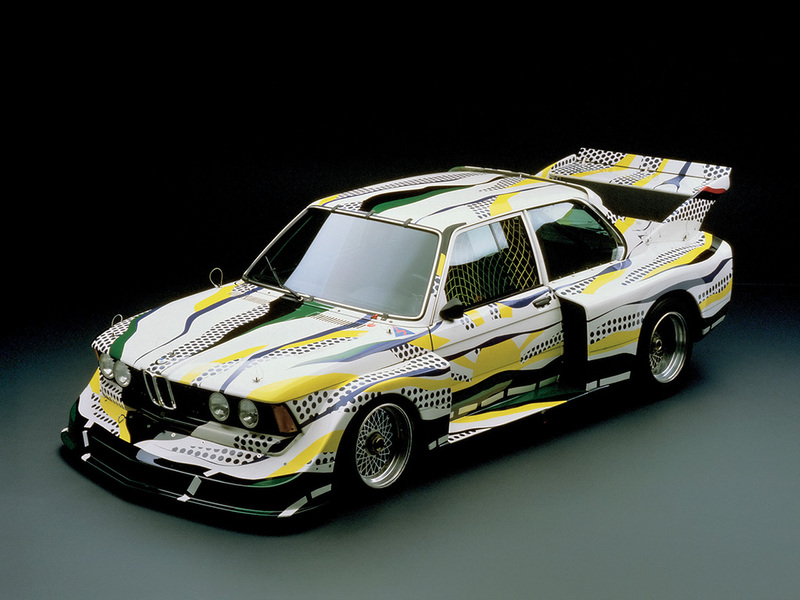 Considering the close-knit relationship between art and fashion, as well as art and cars, it is no surprise that by extension the fashion world has gained and honed an interest in cars and their aestheic values. Designers have incorporated cars into garments, exemplified in the almost sculptural utilization of car parts in Thierry Mugler’s Spring/Summer 1992 collection. 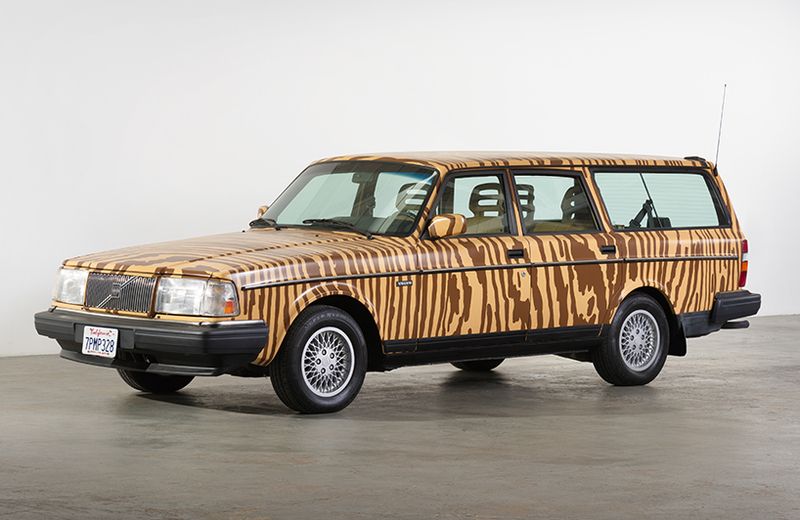 While others have used the motif of cars in prints and accessories, as seen in Christian Dior’s Spring/Summer 2001 handbags and Chanel’s 2017 Resort collection. Some designers step further outside of the box, utilizing car’s interiors as inspiration, seen in Celine’s Fall/Winter 2011 collection and Balenciaga’s car mat skirts for Fall/Winter 2017. 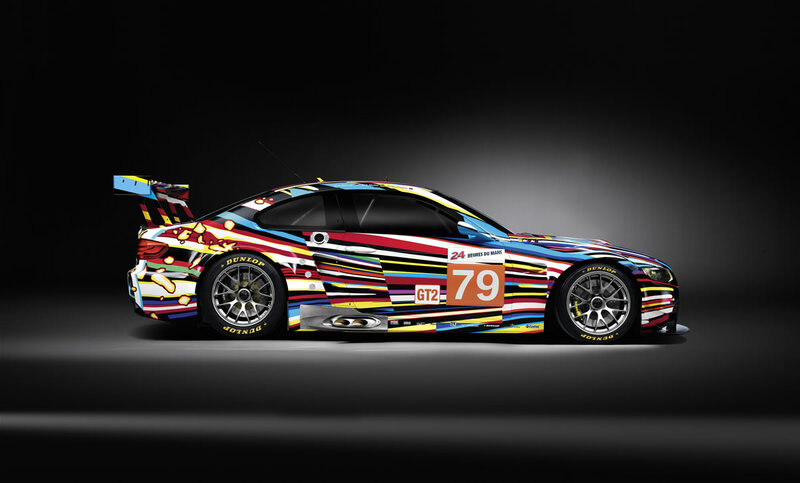 Prada, in particular, has often utilized various aspects of the car motif in prints, patterns and entire collections. 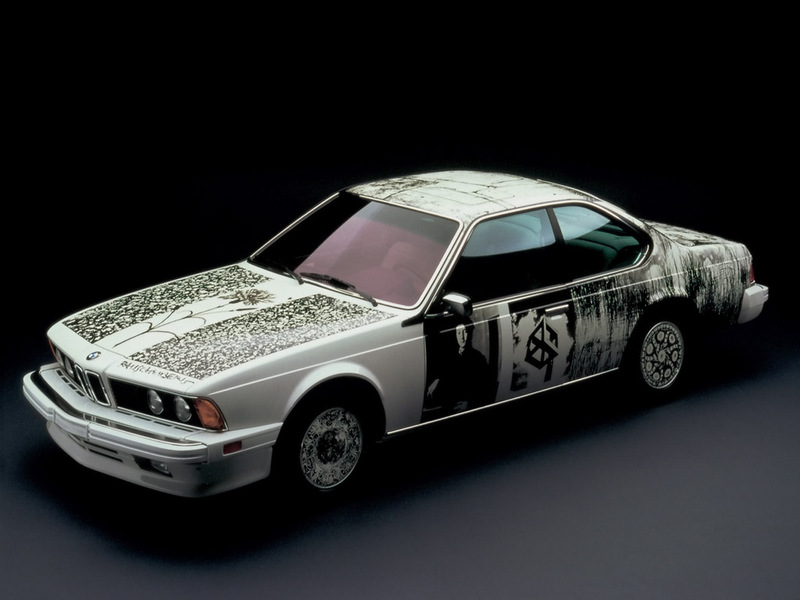 The brand’s Spring/Summer 2012 ad campaign featured retro females in cars, as did the heels, graphics, and purses of the featured collection, while that same season, car graphics appeared in the brand’s menswear prints. The theme reemerged in 2016 for the women’s resort collection as well as the Spring/Summer men’s collection, both of which featured complimentary racecar patterns. 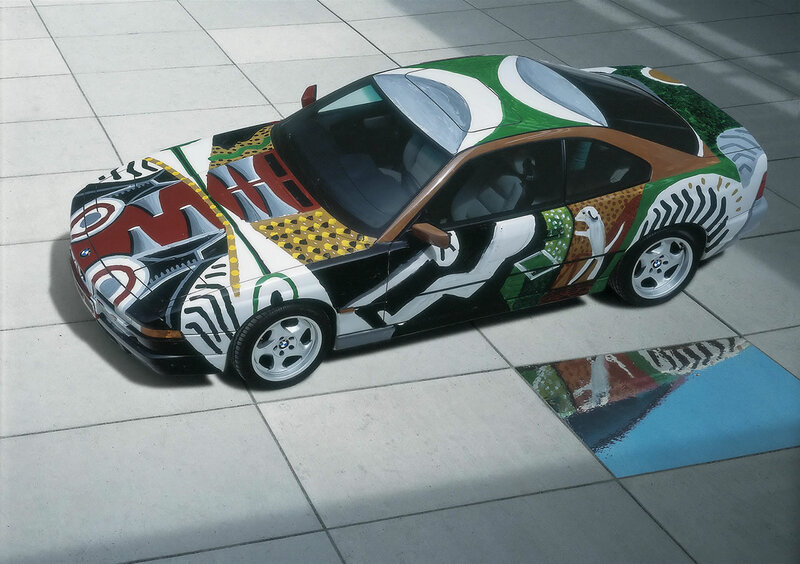 Being that the car is oftentimes symbolic of youth, freedom, and mobility, it is no surprise that Prada has shown continued interest in automobile themes and motifs. 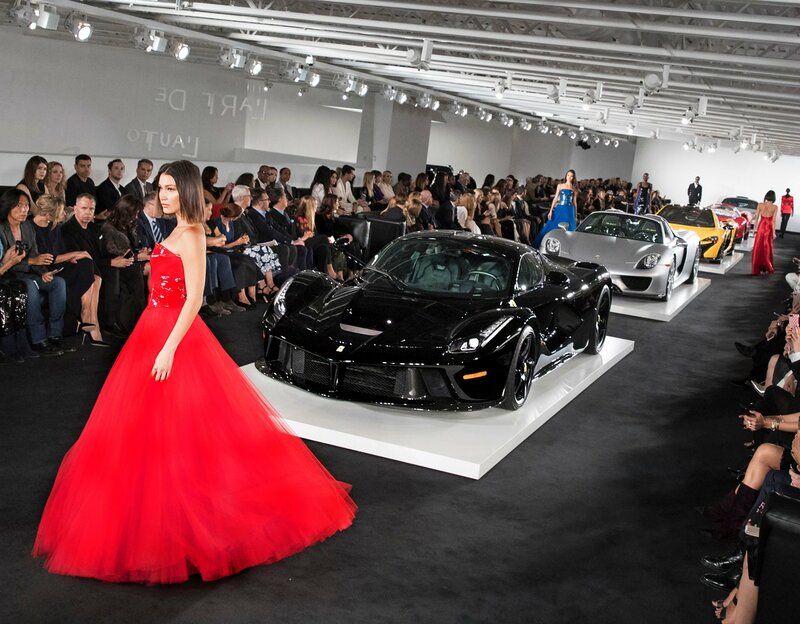 On the runway, cars are incorporated into sets for much of the same reasons. 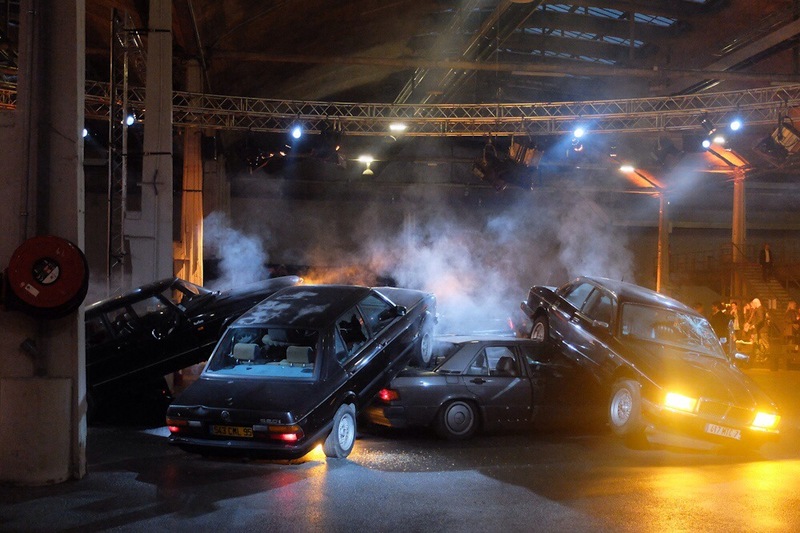 Givenchy’s Spring/Summer 2014 show piled vintage Mercedes-Benz, BMWs, and Jaguars as the backdrop for the featured collection, creating a junkyard-meets-car-crash moment. Ralph Lauren’s Fall/Winter 2016 show used the designer’s own car collection as a runway set, while the actual collection utilized cliché colors, textures, and finishes often associated with cars aesthetics including reds, yellows, and bright blues as well as shiny, patent leather. Likewise, Miu Miu’s 2018 Resort show, presented at the Paris Automobile Club, utilized a racetrack environment to support the collection’s “Car Culture” theme, which playfully explored ideas of masculinity and classic cars, the them carried over into their advertising campaign that season as well. 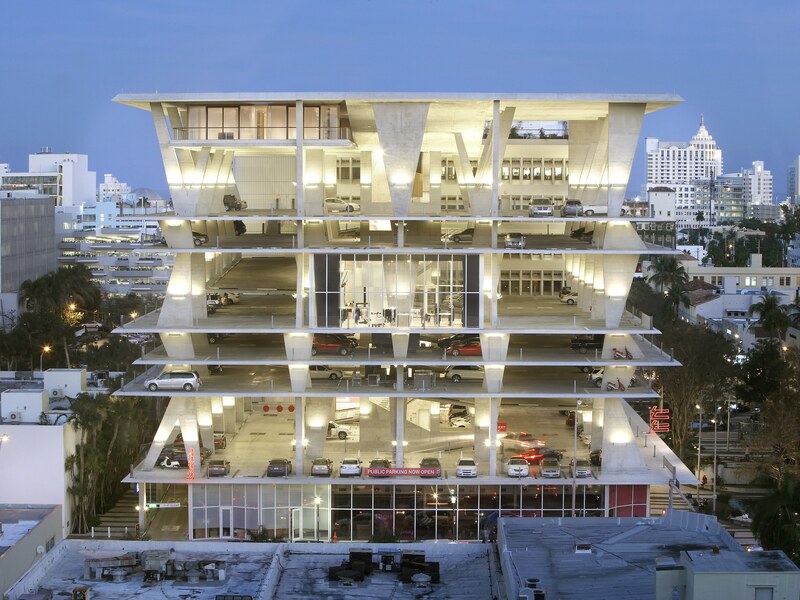 Although architecture seems decidedly removed from car production, architects, too, have become enamored with the endless possibilities of the automobile. 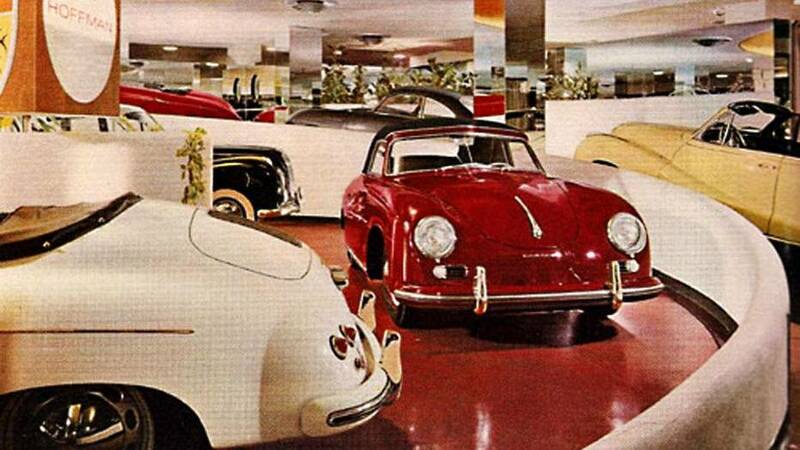 In 1955, Frank Lloyd Wright designed a Hoffman auto showroom in New York City. Wright’s design contained a descending display ramp that circled around a rotating platform. 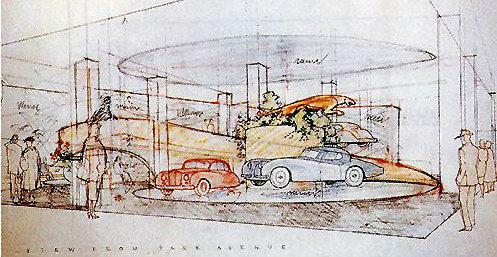 The showroom may have been a source of inspiration for Wright’s designs for the Guggenheim, or vice versa, further solidifying the relationship between art and the automobile. 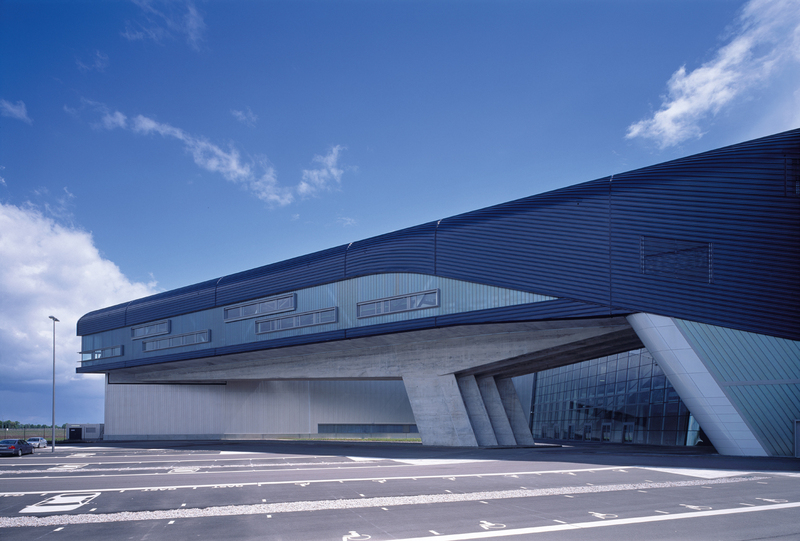 In addition a more contemporary example is famed architect Zaha Hadid, who designed the BMW Central building in Germany, turning a once-boring office space into a fluid and dynamic creation that drew inspiration from BMW cars and eliminated the blue-collar/white-collar divide in the car manufacturing space. 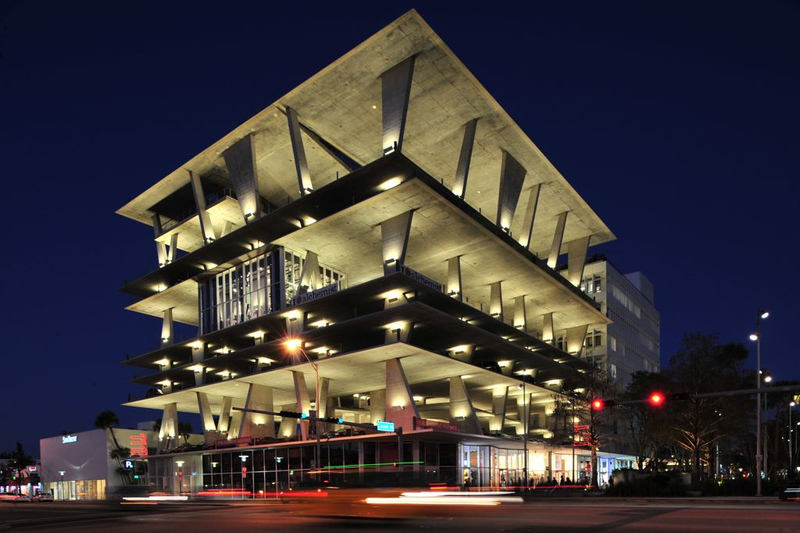 Swiss architectural firm Herzog & de Meuron designed a Miami parking garage in 2010. 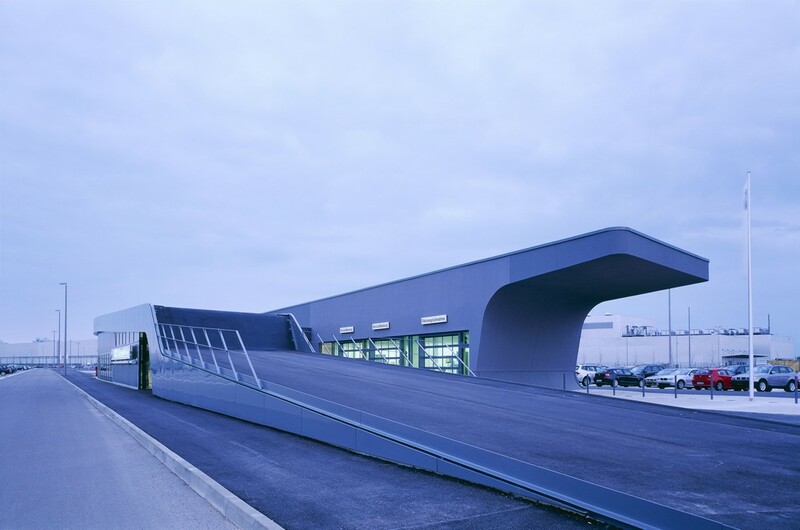 The lot uses dynamic, slanting shapes to open up the typically gloomy lot space and floods it with light. Since its opening, the lot has become as much a cultural attraction as a functional space for parking cars, creating a model for the type of innovative environments that can be created in places one never expects.